This game has unused playable characters. 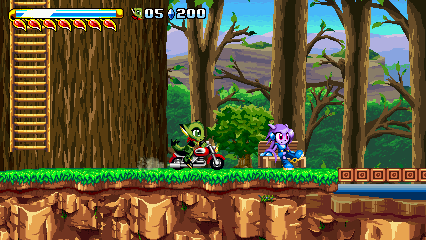 Freedom Planet is a crowdfunded 2D platformer released in 2014 about a trio of female anthropomorphic animals on a mission to save their home planet from an evil warlord. 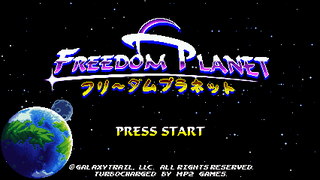 Initially a Sonic fan game, the developer GalaxyTrail created an original property out of it, right before its first publication. 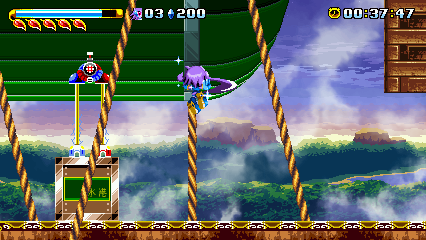 A sequel with the very obvious title, Freedom Planet 2, has been announced for 2019. A lot of audio goes to waste. Way too much to list here. 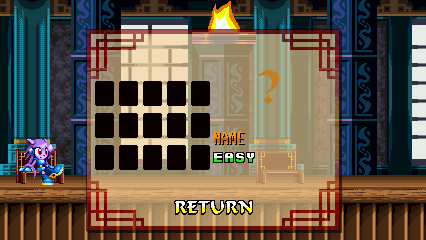 Found in Black Load (frame number 1), this screen allows you to easily select most of the game's levels and cutscenes. While its available in all prototypes, in all release versions it's only possible to access the screen through memory editing. A feature disabled in all release versions. Left-clicking the upper left part of the HUD toggles this mode, indicated by the health petal sound effect playing. The timer gets replaced by text that literally reads "DEBUG MODE". 0 -> Gives Carol her motorcycle. 1 -> Fills up your energy bar. 2 -> Lets you cycle between the shields (in order: None -> Wood -> Fire -> Metal -> Water -> Earth). 3 -> Fills up your petals. 4 -> Sets the invincibility timer to 600 (10 seconds). 5 -> Sets your amount of lives, cycles between 1 to 5. 6 -> Sets your horizontal speed to the maximum horizontal velocity (15). 7 -> Sets your vertical speed to -15. 9 -> Sets the petals to 0. It's possible to leave debug mode by clicking on the upper-left part of the HUD again. A leftover from early prototypes. The sprites in order: Crystals, Petals, Fire Shield, Metal Shield, Water Shield, Invincibility, Speed Up, Extra Life (for Lilac), Extra Life (for Carol, presumably, but without any graphic), Wood Shield, Earth Shield, Keystones (presumably), (Yen? ), and... a chicken? They are still sometimes used as a timer to delay their effects. Variable A starts with 0 and increases by 1 each frame. Crystal Flowers, Shard Flowers, Keystone Monitors, Bombs, and Crates spawn their contents instantaneously and as such, the icon will not even be created. Other types of monitors are set to be triggered once A reaches exactly 64 (which is a whole one second and four frames). Despite the sign only showing up on very early prerelease footage, it is still used in the game. Can be found in Lilac's Treehouse (Day) and is used during a cutscene. When Lilac's blooper is triggered, variable A will store Lilac's original X position right before she runs off-screen (which would be a value of 252). 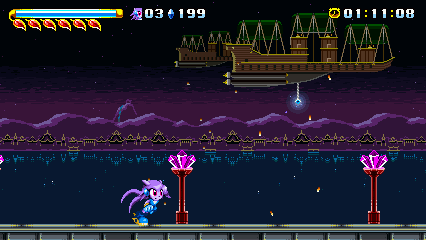 Once the next line of dialogue plays, Lilac will be moved back to the previously stored X position. Frame number 14 and 15. While technically used, both areas are only seen in cutscenes and cannot be explored in any of the game's release versions. Through memory editing, it's possible to access the frames and, as long as global variable Checkpoint doesn't have a value 11 or higher, no cutscenes will be triggered. You can enter the treehouse and get to the living room, but there is, unfortunately, no way to enter the bedroom. If you are not playing as Lilac, she will sit outside on a bench next to the bridge. In the night version of the area, Torque (in his Shellduck disguise) can be found along with his tent to the left of the treehouse. The tent, however, cannot be entered. Also, it is now possible to talk with Lilac by approaching her and pressing "Up". However, all this does is temporarily glitching the character you are using (unless you are too far away from Lilac, potentially making you stuck in that case), and none of the assigned voice clips actually play. Pausing the game in both areas brings up the pause screen used during cutscenes. Leaving the area triggers the stage transition, moving the player to the next stage, Aqua Tunnel. Albeit being similar to the Shang Mu Academy, the Shang Tu Dojo has a different setup, and no stages can be played, unfortunately. The background torches ended up reused for Trap Hideout. The frame stores strings that contain a bunch of enemies and boss names. 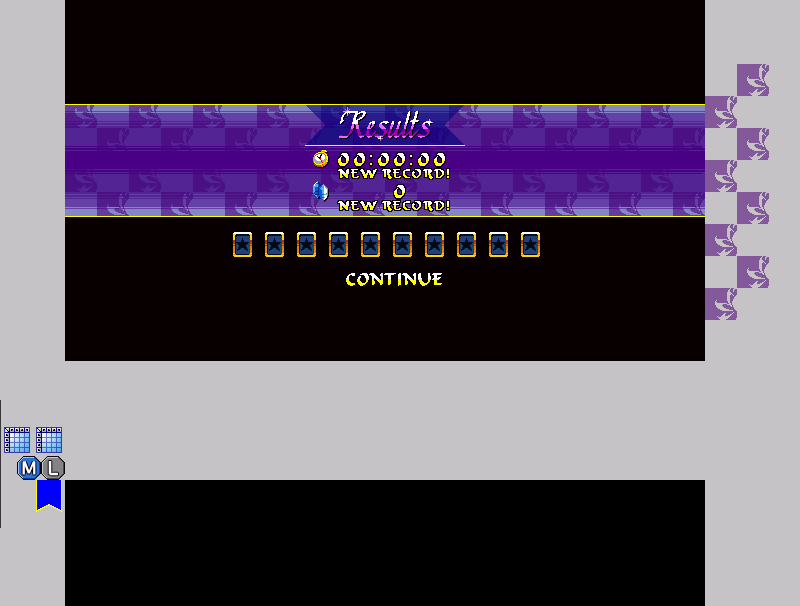 An exact duplicate of the Result Screen found in early prototypes. It's missing all of its functionality though and only the graphics are present. Found in Update Records (frame number 8), placed 120px above the game window. There still exists an older version of Fortune Night's scenery shift (when leaving the mall), with one big difference. The normally invisible Sky Battalion in the background is now seen raining down projectiles while the ship in the front pulls up the Kingdom Stone. Reactivating this will result in a soft lock as the Robopanther cutscene won't get triggered. Originally, the game allowed you to change the colors of the current character's outfit (with exception of Milla, who gets a new hair color). 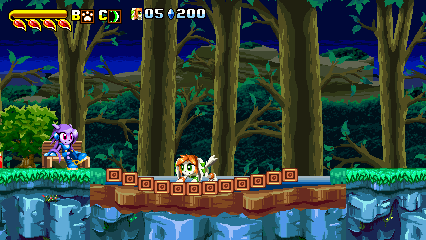 Even though Lilac, Carol, and Milla all have finished palettes (as shown above), Torque and Spade, unfortunately, have no palettes made for them. This went unused as it caused graphical glitches in all "turbocharged" builds of the game. Not all stages suffer from them but special mention goes to the Robopanther boss, which can soft lock the game due to the glitches occasionally modifying some objects' functions. 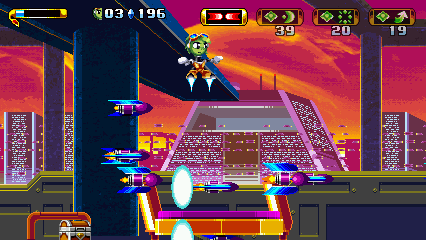 The Magnetizer is located in the earth ship in Sky Battalion but is placed out of bounds and removed from memory because of it. Design-wise, it looks pretty similar to the Pelletizer, just with magnets instead of cannons. It has 15 HP. 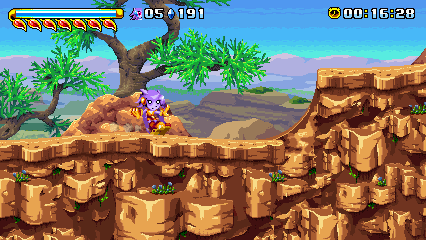 Once the player is standing under it, it starts attacking by launching its magnets downwards, which can deal touch damage. There also exists a special kind of crate called Enemy_MagnetizerCrate (that just looks exactly like a pushable crate found in the metal ship). If the Magnetizer is standing under one, it will launch its magnets and pick the crate upon contact, making it possible for the crate to be moved around. After some time passed or if the player happens to stand under the Magnetizer, it will then drop the crate (that can't crush but hurt the player). The Fleet Missiles can be found in the unused stage Horizon Starport. They will try to get to the left side of the player and attack by launching themselves to the right (dealing touch damage during that phase). They only have 1 HP and destroying one of them drops a crystal. The Chain Lightning is also part of Horizon Starport. It has 15 HP, and attached to it are six orbs (Enemy_ChainLightningLink, three for each side) that rotate around it. 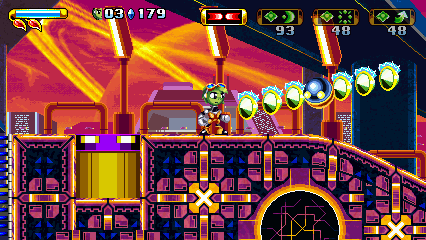 After some time, the orbs stop rotating and conduct electricity that can damage the player. Destroying the Chain Lighting will drop a metal Keystone. 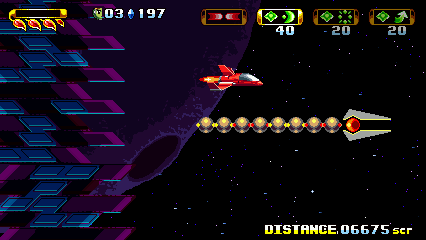 Both types of Asteroids can be found in the Space schmup. The only things they do are rotating and floating in one direction (by default, to the left). The small Asteroids have an HP amount of 5, whereas the big have 12. Destroying one of the big Asteroids causes it to break into four smaller Asteroids that spread in four directions. Lilac breathing an air bubble. Since the Sonic-typical bubbles were changed into a single bubble that would instantly fill up the air meter upon contact, there was no use for this animation. 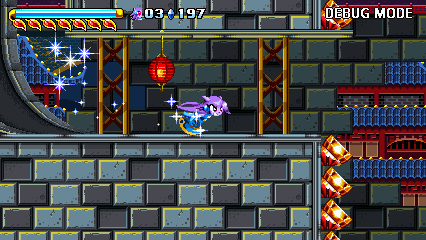 An older version of Lilac's dance. An alternate sprite of the Pushup enemy. Its upper cannon looks different and it's missing its bottom cannon. Unused animation of the Ninja enemy (presumably) throwing a Ninja Star. Since the Bike Ninja can't leave its bike (exception being its death animation), it goes unused. Unused laughing animation for the Ninja enemy. Sprite dump of the Bike Ninja enemy. More sprite dumps, now of the Rocket Puncher enemy. Sprite dump of an never implemented enemy called "Crane", which is literally a crane. A differently colored floor tile. An older version of the Fleet Missile. It used to be a bit thinner and colored entirely in blue (with exception of the flame) instead of both purple and blue. An older version of the mural found on the wall of the living room inside Lilac's Treehouse. The poster of the Ninja Hurk translated into Chinese (莫霍克突变; Mohawk Mutation). The sprite of an unused enemy called "Mallet", which is basically a recolored Turretus, but with a giant hammer attached to it. It was never programmed into the game and remains out of bounds. Sprite dump of the "Hopper Missile", at different angles and with various design tweaks. Like the Mallet above, they were merely "sketch" sprites for potential enemy concepts. The sprite of a basketball, and a bouncing animation. A basketball hoop along with the net that is attached to it. The old goal post, spinning. End-of-goal post images for Lilac (in her old design) and Carol. 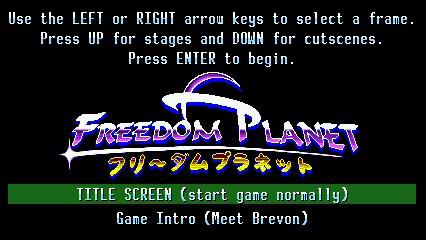 The "PRESS START" text, seen in the title screen, with an + button added on top of "START". Since it's only meant to be used in the Wii U port of the game, it goes unused in the PC version. Older versions of Lilac's save file images. And for Milla, although there's only one image. Save file images for Torque. The "COPY" text that was used for the, guess it, copy save function. Multiple difficulty settings (Easy, Average, Hard to Hit, Hard, and Very Hard), that would've been used for the Shang Tu Dojo. Multiple potions colored after the shields powerups. The purpose is unknown. An older version of Neera's Ice Ring projecile. Looks thinner than the one seen in the final game. Named "Disaster Strikes" in the official soundtrack of the game. These achievements were supposed to be added to Steam once the DLC gets released, but as of now, they remain unused since GalaxyTrail's plans have changed and the Torque/Spade DLC was postponed indefinitely. This page was last modified on 20 January 2019, at 09:12.